If you like your baritone sax tough and hard-swinging, Pepper Adams is your man. Live album 10 To 4 At The 5 Spot runs the hard bop gamut of the period – mid-tempoed tunes that leave a lot of room for expressive blowing, coupled with fat-bottomed balladry. It’s distinctive for the technically brilliant and thunderous approach through which Pepper Adams is duly remembered as the guy who elevated the baritone saxophone to an instrument that could compete with the modern tenors, altos and trumpets of the day. 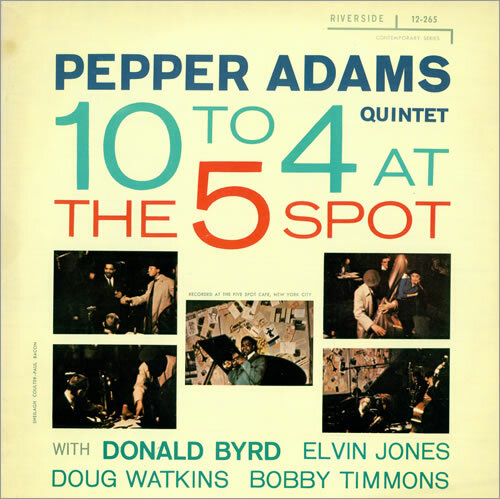 10 To 4 At The Five Spot also boasts the charged interaction between the top rate members of the quintet. A number of musicians of the classic era have said that they felt extra comfortable when they happened to find themselves on the bandstand with colleagues that hailed from the same area. This group of men who were born or grew up in Detroit (excluding Bobby Timmons, who’s from Philadelphia) is exemplary of that sentiment. They sound very close-knit. Another Detroiter, Thad Jones – older brother of drummer Elvin Jones – is the composer of the boppish opening track, ‘Tis, on which all soloists take care of business. The ballad You’re My Thrill finds Adams’ dark, lyrical mood embellished by his typical barking-dog timbre and articulate, jagged phrases. My advise to the listener is to take for granted the Five Spot’s out of tune piano and enjoy the spirited work of Bobby Timmons. His energy is evident in The Long Two/Four, in which he backs Adams and Donald Byrd amazingly alert, stimulating his compatriots by constantly pushing the bars. The condition of the upright piano is the only bad thing to say about the Five Spot. The New York café of the Termini Brothers, situated in the Bowery, was put on the map by Thelonious Monk’s long engagement in 1957 and hosted a responsive and knowledgeable bohemian and artistic crowd. Other illustrious albums recorded at the Five Spot are Monk’s Thelonious In Action and Misterioso and Eric Dolphy’s At The Five Spot 1 & 2. Pepper Adams’ 10 To 4 At The 5 Spot is one of the first Riverside live albums. Pepper Adams gets the Five Spot crowd moving with the catchy jump blues tune, Hastings Street Bounce, that’s chock-full of archetypical jive accents. It’s an Adams original lifted from a traditional riff the baritone saxophone once heard and suavely evokes the spirit of forerunners and contemporaries Louis Jordan, T-Bone Walker and Tiny Bradshaw. There is a certain relish in the statements of the soloists that cannot be attributed only to their considerable talents, but also to the buoyant spirit of the tune. Drummer Elvin Jones lays down a smooth r&b ballroom beat. It is but one of the examples in his career that the drummer, known for his uproarious, polyrhythmic approach, notably with John Coltrane, proofs to be capable of understated, intuitive backing as well. Yourna is a very melodic ballad, written by Donald Byrd. Adams and Byrd embrace eachother with the same warm voicings as their famous counterparts, Gerry Mulligan and Chet Baker, did in ballads such as My Funny Valentine. But their sound and style, however, is the anti-thesis of Mulligan and Baker. They’re more robust. Adams and Byrd sometimes sound like four horns and the climactic accents of Yourna’s theme sent chills through my spine. As evening went into night at the legendary Five Spot café, the bohemian clientèle had the pleasure of enjoying a vintage date of Pepper Adams & Co.